The Poly Studio USB Video Bar (the Polycom Studio) combines business-class performance with simplicity for small rooms and huddle spaces. The plug-and-play functionality works with nearly any video platform and any budget and forms a high end HD audio and video component within VideoCentric’s Huddle Room solutions. 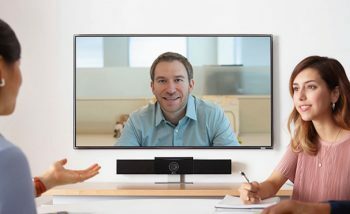 Poly Studio eliminates the frustration, with a simple USB connection providing best in-class HD audio, professional video conferencing features and all the features needed for high end collaboration in huddle rooms and small meeting spaces. Many video users today are frustrated by the DIY experiences that are result in poor audio and mediocre video that don’t allow people to see and hear everyone clearly. Often with the aim to do things on the cheap, many meeting rooms over the past few years have been poorly planned and use consumer grade products to create a less than optimal solution. The Poly Studio has been designed to work with almost any cloud-based video platform, including Microsoft Skype for Business/Teams, Zoom, BlueJeans, GoToMeeting, Lifesize and more. For organisations looking for Microsoft Teams interoperability solutions for the meeting room, the Poly Studio forms a key part of VideoCentric’s Teams integration offerings for personal Teams users, or for those looking to add Microsoft Teams into small meeting spaces for 4-6 people. To discuss more about the Poly Studio or to find out about all the huddle room solutions available and what may work best for you, get in touch with our team today. Or, find out more about Poly, the new brand of Plantronics and Polycom combined.